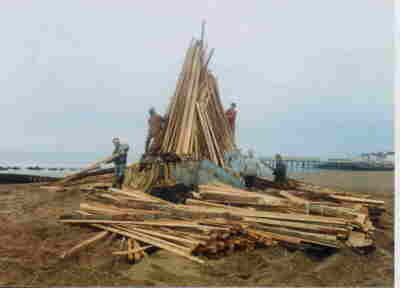 What is involved in being a member of Hastings Borough Bonfire Society? looking back on (hmmm, lets see now...) about ten month’s membership, the words 'fun' and 'enjoyable' spring to mind. I have always enjoyed a bonfire and firework display, and so originally, I joined to take advantage of the coach transport arranged to attend other displays throughout Sussex. Apart from actually helping to build the fire, I didn't think much more could be involved. How wrong can you be! Whilst the latter few months of 1998 were occupied with both the local event (October, combining Guy Fawkes celebrations with the commemoration of that invasion) and attending others (from Fletching to Rye, Robertsbridge to Lewes, and more), the new year brought much, much more into focus, There have been the fund-raising events, including a Summer Fun Day (bit damp this year!) and a pub crawl. Members have helped at the Hastings Marathon, Half-Marathon, 10km Road Race and the Beer Festival, marshalling public salety. pyrotechnic display at this years’ Hastings Bonfire on 9th October.Now we are back into the Bonfire season once again. and enjoying that heady mix of warm fires on cold evenings, brilliant displays in utter darkness, and the spine-tingling experience that is, simply, Bonfire. On the horizon, though, are all the other possibilities throughout the of sea-life created for that seafront parade will know how good they are! Same Sky coming year, another action-packed twelve-month with a host of new friends, and amongst the fore-most will be the Millenium celebration display, set by the Bonfire Society for Hastings Borough Council. Members are free to do as much, or as little, as they wish - just joining helps us raise the money to pay for the display, and through that, to collect funds on the night to benefit many local charities. Come along and enjoy the pageant - and you could join this growing crowd of friendly, relaxed individuals who together make up HBBS. Bonfire started as a direct result of the activities of a group of conspirators who sought to overthrow the Protestant King James 1st and establish a Catholic monarchy on the English throne. These conspirators were led by Catsby and were almost snccessfuil in their attempt to blow up King and Parliament on November 5th 1605 with 36 barrels of gunpowder stored in the cellar of the House of Commons. One of the conspirators, Guy Fawkes, was caught in the act and King and Parliament were saved. After the English Civil War 1647 saw the establishment of the Commonwealth under Oliver Cromwell as Lord Protector. One of the edicts of his government was that public holidays of all kinds should cease as they were a waste of resources and people should be working rather than enjoying themselves. Even Christmas was abolished. The one exception was November 5th, as this was a celebration of deliverance from a potential Catholic monarch, a celebration that the Protestant Cromwell felt important as the only celebration of the year, it became popular and grew to become the large event we still see today. When most other popular holidays and customs were restored by Charles the Second November 5th continued as one of them. It was a popular celebration as it could be used for any occasion as the political climate changed. It could be pro Monarch, pro Parliament or anything else that seemed to fit. 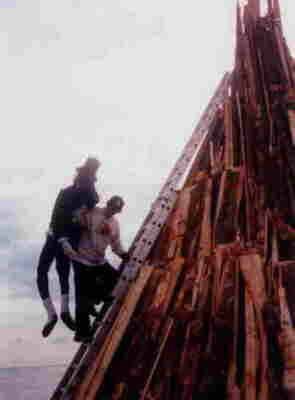 Bonfire always was and still is broadly political and patriotic. Though it has always been a custom of the people and an expression of their will, rather than the particular rulers of the time. This all led to the decline of the celebrations across most of the country. The people of the southern counties from Sussex to Devon organised themselves into societies to continue the custom. Smuggler costumes and black faces as disguise were used for the first time, these were to prevent being recognised by the authorities. Effigy burning of unpopular people and people opposed to bonfires became common. There are references to effigy burning on Hastings beach in the 1820s. At this time torch lit processions and style of celebration we see today were established. The first Bonfire Society was established in 1847 in Lewes in response to the Riot Act being read in the town. The St. Leonards Society was formed in 1859 and in 1860 the larger Hastings Borough Bonfire Society was formed. By 1884 there were five societies in the town, all with great rivalry. The late nineteenth century saw a concerted effort to suppress Bonfires across England, the banning of fires on the street in 1905 and the banning of fireworks on the streets in 1909 more or less stopped the custom. It survives in Sussex because of the organised Societies. Two World Wars have helped to kill Bonfire and Hastings was a casualty of the second. My own conversations with elderly people in the town confirm they had had enough of fire and loud bangs. The Sussex Bonfire Societies now celebrate every weekend from the end of August to the end of November, thus allowing us to attend each others celebration. The Hastings Borough Bonfire Society was established in 1995 to continue the custom and traditions of our forebears. We have chosen the nearest Saturday to October 14th, (the Battle of Hastings ), as appropriate for this town.